Need to make a quick hood for a cloak or cape? Here's my DIY tutorial outlining how I made one when I was asked to make a hooded cloak in a hurry. The hardest part of making the cloak was constructing the hood for it and then attaching it onto the cape once done. This post will walk you through how to make a quick DIY costume hood without a pattern and then it will lead on to another article which will explain how you can sew it on to the cape. 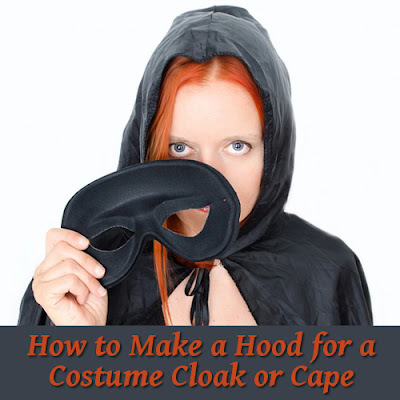 It may be that you already have a plain cape like a black one which is often used at Halloween and you want to know how to make a hooded section for it. So this post with photos will explain what you need to do. 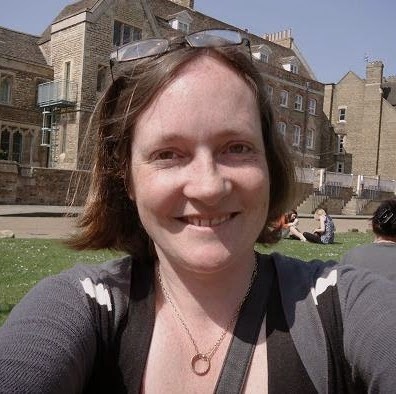 When my daughter came home from school and asked for a hooded cloak for a dressing up event, I was very short on time to sew one up and I also had no available pattern that I could follow. Luckily I had a large piece of thick fabric which was ideal for what she needed. So I took some measurements and got to work. Measurement A: First you need to take some measurements from the person who will wear this before you can start making the hood. Loosely drape a measuring tape from the top of one shoulder up to the top midpoint of the head. The measuring tape should drape a little loosely to mimic how a hood will sit across one side – it definitely doesn’t want to be tight. Add on an inch to this measurement to allow for a seam allowance and call this Measurement A. Measurement B: Next you need to take another measurement to work out how much space you need from the front of the hood which comes over the top of your eyes to the back of your head. You can make this short so your hood shows off the front of your hair or you can make this measurement long so it looks more mysterious and starts to hide your eyes in shadows. Bear this in mind and measure from the top of your head right at the back section to the top of your forehead. Then add on any extra amount you want for the hood to extend over your eyes plus about an inch for seam allowance. If in doubt, go a little bigger than smaller. Call this Measurement B. Measurement C: Your final measurement is around your neck. Measure very loosely around the neck area, halve this measurement and add on an inch for seam allowance. This is Measurement C.
No-Measure Method: A cheats way of drawing the hood onto fabric without taking any measurements is simply to grab a hoodie that you wear, fold it in half vertically so you get the shape of the hood and draw around it onto a piece of folded fabric with the top of the hood against the fold of the material. That gives you a rough hood shape to work with and no measuring needed! 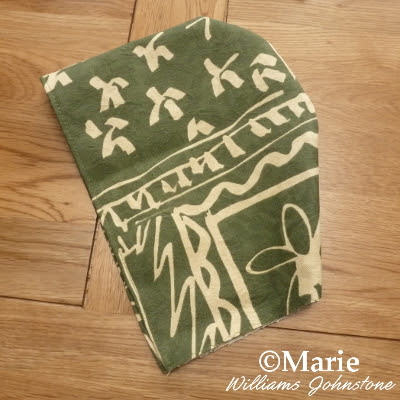 Using your measurements, you draw your hood shape onto a piece of folded fabric. In the photo above, the fabric is folded at the top. I measured down from the top fold several times in a straight line with Measurement A and marked this off using tailor's chalk. This makes a line going horizontally across the fabric. Then I used Measurement B across this horizontal line and marked this off. I then marked this position off at several points going up the fabric to make a vertical line. You should now have a rectangular shape marked off on your fabric. Use Measurement C as follows. Measure from the bottom right corner of the rectangle across to the left on this line and mark off Measurement C. This is the collar area. 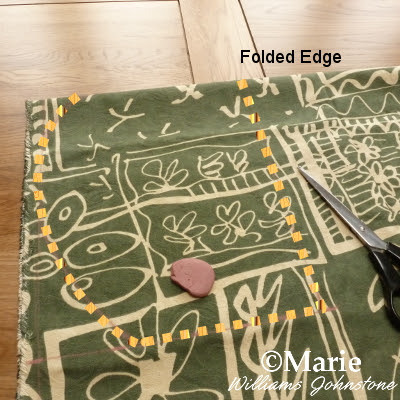 Draw a curved line from this measurement up to the top of the folded fabric as shown outlined in yellow on the photo. Carefully cut out this pattern with the fabric folded. Once you have this cut out, unfold the fabric. 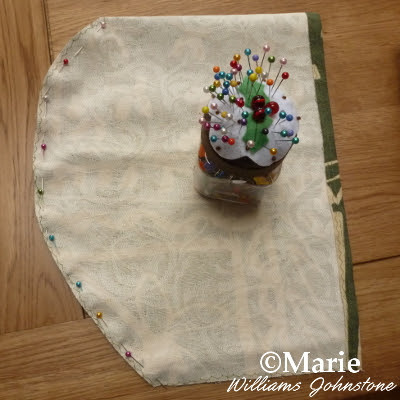 Sew a quick overcast stitch or zigzag stitch over all the raw edges to stop the fabric from fraying. Then down the long straight edge, fold this back from the front to the reverse of the fabric as shown around 1/4 to 1/2 inch or so (whatever you feel more comfortable sewing) and sew down with a straight stitch. Fold the hood in half with the right sides of the fabric together on the inside and the reverse of the fabric on the outside as shown. Match this up nicely then pin down the curved side as shown. Sew from the top of this curve to the bottom with either a 1/4 or 1/2 inch seam and then turn it inside out to reveal a very quick makeshift hood made without a pattern. It sounds more complicated than it is. Once you understand the measurements you need to take to form this, it becomes very easy. As I said, a good cheat's method is to look for an existing hood and draw around the flattened shape. Once you understand the measurements you need to take to form this, it becomes very easy. As I said, a good cheat's method is to look for an existing hood and draw around the flattened shape.